Ipsos’ latest Perils of Perception survey highlights how wrong the online public across 38 countries and districts are about key global issues and features of the population in their country. Teenage pregnancy is overestimated across the world, often by a staggering amount. Overall, the average guess is that 20% of teenage girls give birth each year when the reality is 2%. And some countries guess that around half of teenage girls give birth each year, when the highest actual figure in any country is 6.7%. Murder rate: the large majority of people in Britain think the murder rate is higher now than in 2000, when it is actually around 29% lower. A third (36%) think it’s higher, 39% think it’s about the same, and only 19% correctly guess that it is lower. Terrorism: only 15% of Britons correctly say that deaths from terrorist attacks in Britain were lower between 2002-2016 than they were between 1985-2000. Half (47%) think deaths from terrorism were higher over the last 15 years and 29% think they were about the same, when in fact they were significantly lower, down from over 300 to 62. Foreign born prisoners: we think that immigrants make up a much greater proportion of the British prison population than they actually do. We guessed an average of 34% of all prisoners were born in a foreign country, but the actual figure is 11.8% (in line with immigrants’ share of the overall population). Teenage pregnancy: we hugely overestimate the proportion of 15-19-year-old women and girls giving birth each year. We think it’s 19% (one in five) when the actual figure is only 1.4% (one in seventy). Vaccines: 55% of Britons are unsure or believe that there is a link between some vaccines and autism in healthy children despite the claim being widely discredited: 20% believe the statement to be true and 35% say they don’t know, with 45% saying it is false. Diabetes: we significantly overestimate the prevalence of diabetes - we think that 27% of people in Britain have diabetes, when the actual figure is around 5%. Good health: more generally, we think other people report their health as worse than they actually do. Our average guess is that 55% of people say their health is good or very good, but actually 74% say their health is good or very good. Suicide: One of the few areas of relative accuracy for Britons was on the proportion of young deaths by suicide. We guess that 21% of deaths of women aged 15-24 were due to suicide, when the actual figure is 18.5%, and we guess that 25% of deaths of young men are due to suicide when the actual figure is 28.4%. Smartphone ownership: we overestimate how many of us are connected by technology. For example, we think that 81% of people in Britain own a smartphone, when only 69% actually do. Facebook membership: and similarly, we overestimate Facebook membership, with an average guess that 74% of Britons aged 13+ have a Facebook account, when the actual figure is 58%. Alcohol: Britain has a global image as heavy drinkers: looking at the responses across all countries, we are the 4th most likely to be picked out as the highest consumers of alcohol from the 38 countries included, behind only Russia, the US and Germany. And, to be fair, this is not very far out, as we actually rank 6th from the 38 countries. But people in Britain overestimate our own booziness: 60% of Britons incorrectly say we’re one of the top 3 hardest-drinking nations in the list. Sugar: and we have an even clearer image as being sweet-toothed. We asked people to select the countries they believe consume the most sugar per person from our list - and Britain was the 2nd most mentioned across all participants in the study, behind a clear winner in the USA. In fact, we’re actually the 6th highest consumer of sugar from the 35 countries included in this question – but again our self-image is that we have a sweeter tooth than we actually do: 73% of people in Britain think we’re in the top 3 biggest consumers of sugar. Belief in Heaven, Hell and God: we think other Britons are more religious or spiritual than they actually are – and in particular, we think that twice as many people believe in Hell than actually do. We think that 45% of people believe in Heaven and 38% believe in Hell, but in representative surveys, only 32% say they believe in Heaven and only 21% say they believe in Hell. We are more accurate in our guesses at belief in God. Our average guess was 43% of people in Britain believe in God, when 39% say they actually do. But Britain is far from the worst in identifying realities – in fact we are the 9th most accurate country in our “Misperceptions Index”. Foreign born prisoners: Most countries greatly overestimate the proportion of prisoners in their country that are immigrants, with the average guess at 28% when it’s actually only 15%. And some countries are much more wrong. For example, in the Netherlands the average guess is that 51% of prisoners are immigrants when it is actually 19%. There is a similar overestimation in South Africa, France and USA. However, in Saudi Arabia the proportion of foreign born prisoners is greatly underestimated. The average guess was 26%, but the actual figure is 72%. Teenage pregnancy: All countries overestimate teenage births, some by a staggering amount. For example, in Brazil, the average guess is that 48% of 15-19-year-old women and girls give birth each year when it is actually 6.7%. The other Latin American countries were also massively out, particularly Colombia, Mexico and Peru. South Africa were similarly incorrect with an average guess of 44%, where the actual figure is 4.4%. Even those who are closest still overestimate the extent of the issue: for example, Denmark and Norway both guess 8% but the actual figures are 0.4% and 0.6% respectively. Smartphone ownership: Every country overestimates smartphone ownership, with some incredibly high estimates in some countries. Topping the chart is Indonesia whose average guess at smartphone ownership is 85%, when the actual figure is only 21%. This may be because our study is conducted online, and in lower internet penetration countries these populations will be more middle class and connected, and therefore drawing from their personal experience, thinking the rest of the country is more like them than they really are. But even in countries with high internet penetration, overestimation is still significant: for example, in Germany the average guess for smartphone ownership was 86% whilst the actual figure is 69%. Sugar: but the USA is correctly seen as having the sweetest tooth, with 58% picking them out as the highest sugar consuming nation, way ahead of anyone else. Other nations such as France and China are wrongly seen as high consumers of sugar. France came up as joint 3rd most mentioned across participants in our study, but their actual global ranking is 16th, and China came up in our top 5 mentions, but globally they are 24th. The USA are most likely to think of themselves as the most sugar consuming nation with 69% of people in the US putting themselves top. Ipsos’s latest Perils of Perception survey highlights how wrong the online public across 38 countries are about key global issues and features of the population in their country. Across all 38 countries in the study, each population gets a lot wrong. We are often most incorrect on factors that are widely discussed in the media, such as deaths from terrorism, murder rates, immigration and teenage pregnancy. 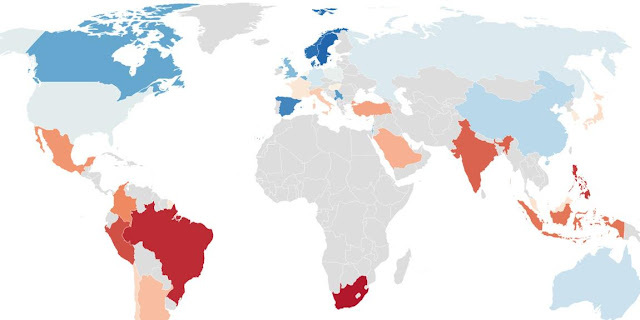 It is also clear from our “Misperceptions Index” that the countries who tend to do worst have relatively low internet penetrations: given this is an online survey, this will reflect the fact that this more middle-class and connected population think the rest of their countries are more like them than they really are. These are the findings of the Ipsos MORI Perils of Perception Survey 2017. 29,133 interviews were conducted between 28th September – 19th October 2017. The survey is conducted in 38 countries and districts around the world, via the Ipsos Online Panel system in Argentina, Australia, Belgium, Brazil, Canada, Chile, China, Colombia, Denmark, France, Germany, Hong Kong, Hungary, India, Indonesia, Israel, Italy, Japan, Malaysia, Mexico, New Zealand, Peru, the Philippines, Poland, Russia, Saudi Arabia, Singapore, South Africa, South Korea, Spain, Sweden, Turkey, Great Britain, and the USA. The following countries used either online or face-to-face methodologies: Montenegro, Netherlands, Norway and Serbia. Approximately 1000 individuals aged 16-64 or 18-64 were surveyed in Australia, Brazil, Canada, China, France, Hong Kong, Indonesia, Italy, Japan, Montenegro, Norway, Russia, Serbia, Spain, Great Britain, and the USA. Approximately 2000 individuals aged 16-64 were surveyed in Germany. Approximately 900 individuals aged 16-64 were surveyed in Netherlands. Approximately 500 individuals aged 16-64 were surveyed in Argentina, Belgium, Chile, Colombia, Denmark, Hungary, India, Israel, Malaysia, Mexico, New Zealand, Peru, Philippines, Poland, Saudi Arabia, Singapore, South Africa, South Korea, Sweden, Turkey.